Committed runners from all over the world have set new PRs with the Hansons training program--the same approach that has turned Hansons-Brooks Distance Project runners into champions. Now in Hansons Half-Marathon Method, the Hansons-Brooks team shares its unique, winning approach to the popular half-marathon distance. 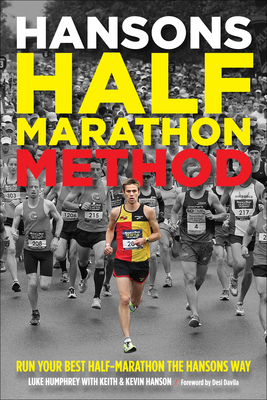 With half-marathon training programs for intermediate and advanced runners, as well as a welcoming Just Finish Program for newer runners, Hansons Half-Marathon Method prepares all athletes for their best performance. Hansons athlete and coach Luke Humphrey explores the differences between the Hansons method and other training programs and then shows runners how to make the Hansons half-marathon training program their own. He guides runners through choosing the right training plan and offers a practical guide to setting race finish time goals. Humphrey reveals the Hansons approach to precise half-marathon pacing, showing runners how to find their most effective paces for the Hansons SOS ("something of substance" ) workouts--speed, strength, tempo, long, and easy runs. He coaches runners on how to modify the plans to work around busy schedules and missed workouts. He answers frequently asked questions on switching workout days, managing fatigue, incorporating races into training, and adding mileage. Luke Humphrey is head coach of Hansons Coaching Services and a member of the Hansons-Brooks Distance Project. Humphrey holds a B.A. in Exercise Science from Central Michigan University, an M.S. in Exercise Science from Oakland University, and is a Certified Clinical Exercise Specialist with the American College of Sports Medicine. Humphrey is also a professional distance runner with top 10 and podium finishes in major U.S. running races from 10K to marathon, as well as two-time qualifier for the Olympic Trials. Kevin and Keith Hanson are elite running coaches and co-founders of the Hansons-Brooks Distance Project. Kevin has earned multiple Coach of the Year distinctions in recognition of the performance of athletes racing in his programs.